New to Sea of Faith  Start here! Frequently Asked Questions  Questions and queries people frequently raise about the SOF. You can mail us your own question and we will try to answer them on this page. Sea of Faith Trustees and Officers  A list of our current Trustees along with contact details. Introducing Sea of Faith  Beginners start here. 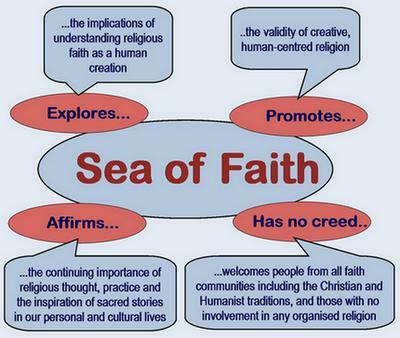 A concise introduction to the history, beliefs, philosophy, organisation and activities of the Sea of Faith. A Reasonable Faith  an introductory booklet written by David Boulton. It was first published in 1996 and while a little dated is still relevant. A Quaker perspective on SoF  David Boulton gives his Quaker take on SOF. A Roman Catholic perspective on SoF  John Challenor, Chair of Catholics for a Changing Church, gives his view on belonging to SOF. A Humanist perspective on SoF  Margaret Chisman, a member of several humanist organisations and author of The Weekend Haiku Book, explains how SOF fits in with a Humanist worldview. A Buddhist perspective on SoF  Mark Rivett offers a very personal view. A Unitarian perspective on SoF  David Dulley, a retired lawyer and author of the "Mona" books, contributed this article to the UK SoF magazine shortly before his death in mid-1997. Dover Beach  The poem by Matthew Arnold from which Don Cupitt's seminal book, and the network, takes its name. International SOF  Contacts for non-UK residents who are interested in SOF.